Bill D’Alessandro is a former investment banker (sound familiar?) who has made the full-time transition into eCommerce. He found his niche almost by accident and now generates almost seven figures in revenue per year. On this episode, he gets into his experience buying and selling eCommerce sites and the best way to work this into your strategy, even if you’ve never considered buying. Understanding the different ways sellers describe multiples. The major differences between big business sales and smaller eCommerce deals. How to know if a business broker is right for you. The surprising keys to getting a good eCommerce deal. The biggest pitfalls to watch out for when buying a store. Whether to buy or build your store. Congratulations to David from Simi Valley, CA for grabbing your free guide. Be watching your mailbox to receive your Toilet Bowl Coffee Mug! It’s sure to give more weight to the insult that your office coffee tastes like crap. Enjoy David and thanks so much for listening. Excellent podcast Andrew. 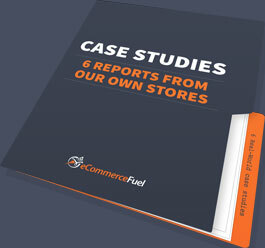 I thoroughly enjoyed the topic of choice in buying and selling eCommerce stores. Back before your podcasts I had personally asked your opinion on starting a business from scratch or acquiring an established business. Since then I have done both and it has been a very exhilarating yet enlightening journey. Thanks again for your advice! This struck a chord with me as I left my Investment bank job in London around ten years ago, much due to the stupid hours I was working, plus my twin boys were born and I missed out on my daughters first two years. I figured if I’m going to work like this it may as well be for myself, from home and not for someone else. I wanted out of the rat race and into my own business. It took me a while before I woke up to ecommerce and set up my first store around four years ago. Recently I launched my latest store and have a couple more in the pipeline (it gets addictive!). Anyway Thanks to Andrew and others I’m making a living from ecommerce and long may it rain! Congrats on getting out of the grind Paul – I know exactly what you mean about entrepreneurship being addictive! Good luck with all the new ventures. A couple questions if you don’t mind. I couldn’t resist checking a little bit on KPElements and found that the last blog post is from Nov ’12, and that there is no real significant ranking in Goo gle. That lead me to wonder what is being done to get traffic? Hope you can help me see more clearly! Hey Andrew, I know this comment is late, but thanks for having me on. Really enjoyed our conversation, and I hope it’s useful for a lot of people!